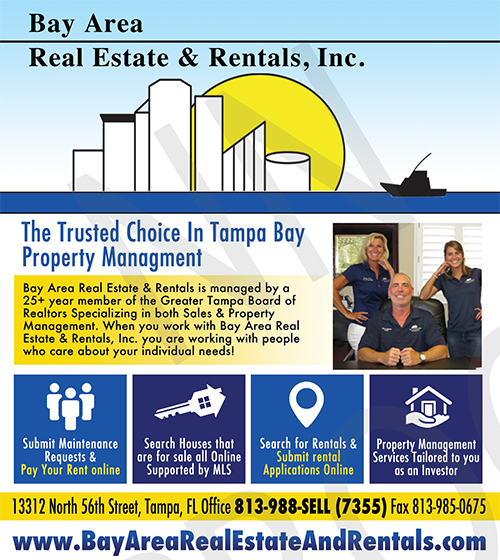 About - Bay Area Real Estate & Rentals, Inc.
Bay Area Real Estate & Rentals is managed by a 25+ year member of the Greater Tampa Board of Realtors (GTAR), Florida Association of Realtors (FAR) and National Association of Realtors (NAR). We are also members of the National Association of Residential Property Managers (NARPM). Specializing in both Sales & Property Management. A company committed to individual service for each of our clients. When you work with Bay Area Real Estate & Rentals, Inc. you are working with people who care about your individual needs! Call and speak with an agent TODAY!! !